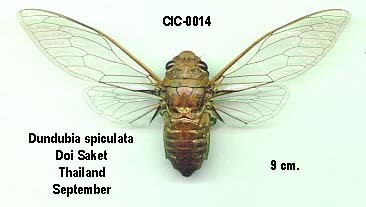 Dundubia spiculata is a cicada found in China, Burma, Thailand, Laos, Vietnam, Cambodia, and Malaysia. Champaka aerata (Distant, 1888) used to be called Dundubia aerata. Its name has changed since 1913. It is found in Borneo. The image says Dundubia aerata, but the newest name of this cicada is Champaka aerata. Characters. — Body long and robust; head somewhat triangularly elongate, about as long as pronotum, the front large and convex, about twice as broad at its base as the length of the anterior margins of the lobes of vertex, ocelli a little farther apart from eyes than from each other; pronotum almost as long as mesonotum, the lateral margins not prominently ampliated but distinctly toothed; abdomen a little longer than space between apex of head and base of cruciform elevation; tympana completely covered; opercula in male long and extending beyond middle of abdomen; rostrum scarcely reaching the posterior coxas; anterior femora spined; tegmina and wings hyaline, the first with the venation normal, the apical areas eight in number, the basal cell twice as long as broad. 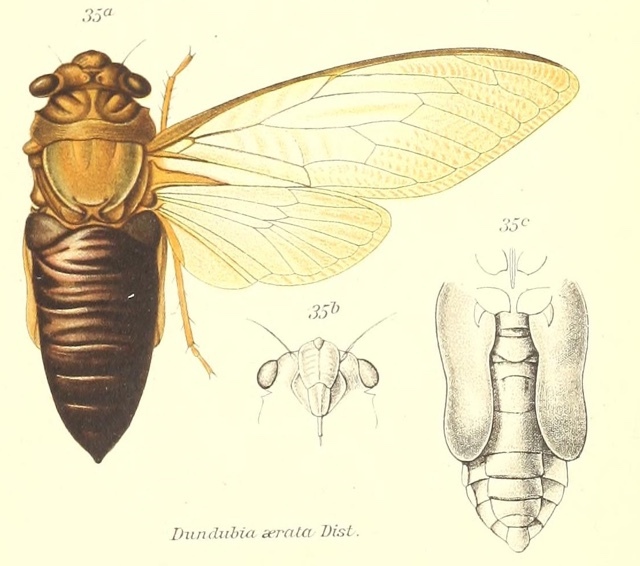 The illustration and genus description comes from the journal Genera Insectorum, and a specific article from 1913 by W. L. Distant titled Homoptera. Fam. Cicadidae, Subfam, Cicadinae. Read it on the Biodiversity Heritage Library website. Current species name verified using Allen Sanborn’s Catalogue of the Cicadoidea (Hemiptera: Auchenorrhyncha). Cicada anatomy photo by Santisuk Vibul. Dundubia sp. This photo points out the Tymbal (the organ that makes the cicada’s signature sound), the Tympanum (their hearing organ), the Operculum (which covers the Tympanum), and its wings. More cicada photos by Santisuk Vibul. Malaysia, like all south-east Asian countries, has a fantastic array of beautiful cicada species. Look at the size of it! Behold the beauty! See all the Tacua speciosa photos. It won’t ever mate again, but it will live for a little longer. See all the Dundubia vaginata photos. Want to learn more about the cicadas of Singapore? The National University of Singapore has six PDF documents about six species of cicadas living in Singapore. Each document contains photos of cicadas, and plenty of interesting information. 1) Record Of The Cicada, Purana usnani Duffels & Schouten In Singapore, With Preliminary Acoustic Analysis by Tzi Ming Leong (Nature In Singapore 2012 5: 13–17 Date Of Publication: 17 January 2012). Link: rmbr.nus.edu.sg/nis/bulletin2012/2012nis013-017.pdf. This document features photos of the P. usnani as well as analysis of their songs. 2) Oviposition By The Black And Scarlet Cicada, Huechys sanguinea (De Geer, 1773) In Singapore by Tzi Ming Leong and Ali bin Ibrahim (Nature In Singapore 2011 4: 303–306 Date Of Publication: 18 October 2011). Link: rmbr.nus.edu.sg/nis/bulletin2011/2011nis303-306.pdf. Huechys sanguinea is a small but beautiful black and red cicada. This document features photos of an H. sanguinea ovipositing (laying eggs) in a tree branch. An image of H. sanguinea, which can be found in Singapore, Thailand and other S.E. Asian countries (and often in acrylic keychains on ebay). 3) Records Of The Cicada, Chremistica umbrosa (Distant, 1904) In Singapore, With Accounts Of Its Mass Emergence by Tzi Ming Leong, Aminurashid and Benjamin P. Y-H. Lee (Nature In Singapore 2011 4: 163–175 Date Of Publication: 15 June 2011). Link: rmbr.nus.edu.sg/nis/bulletin2011/2011nis163-175.pdf. This document features information about distribution, emergence, bio-acoustics, communal feeding, and predation. 4) Records Of The Black And Golden Cicada, Huechys fusca Distant, 1892 In Singapore, With Natural History Observations by Tzi Ming Leong, Mishak Shunari, Laurence Y. K. Leong, and Sai Khoon Foo (Nature In Singapore 2011 4: 203–211 Date Of Publication: 8 July 2011). Link: rmbr.nus.edu.sg/nis/bulletin2011/2011nis203-211.pdf. This document features information about emergence, bio-acoustics, mating, and oviposition of Huechys fusca. 5) Records Of The Black And Scarlet Cicada, Huechys sanguinea (De Geer) In Singapore, With Notes On Its Emergence by Ali bin Ibrahim and T. M. Leong (Nature In Singapore 2009 2: 317–322 Date Of Publication: 5 August 2009). Link: rmbr.nus.edu.sg/nis/bulletin2009/2009nis317-322.pdf. This document features observations of Huechys sanguinea. Huechys sanguinea is a beautiful cicada. 6) The Jade-Green Cicada, Dundubia vaginata (Fabricius, 1787) In Singapore, With Notes On Emergence, Bioacoustics, And Mating by Tzi Ming Leong, Mishak Shunari, Aminurashid and Timothy D. Harvey-Samuel (Nature In Singapore 2011 4: 193–202 Date Of Publication: 5 July 2011). Link: rmbr.nus.edu.sg/nis/bulletin2011/2011nis193-202.pdf. This document features information about emergence, bio-acoustics, and mating of Dundubia vaginata. Dundubia are known for there huge opercula (the structures on their abdomen that cover the cicada’s tympanum (tympanum are a cicada’s ear drums). Santisuk Vibul sent us new photos of the tymbals of the cicada of Genus Dundubia, from Bangkok, Thailand. A new gallery folks: Santisuk Vibul’ s Cicada Photos of Genus Dundubia from Bagkok, Thailand.